The National Reformation Movement (NRM), a medley of radical youth of the main opposition All People’s Congress (APC), has called on the party’s hierarchy to embrace reforms within in order to present a formidable force in the 2023 polls. After the party woefully lost the 2018 presidential elections to President Julius Maada Bio of the now ruling Sierra Leone Peoples Party (SLPP), the youth group conducted a survey across the country to ascertain why the party lost the presidential election. They subsequently compiled a comprehensive report, which was launched last Saturday, coinciding with International Day of Democracy, at the Harry Yansaneh Hall of the Sierra Leone Association of Journalists headquarters on Campbell Street in Freetown. Acting as the chairman during the launch, Osman B. Kamara noted that they have been championing the cause of the APC since their student days at Fourah Bay College and that they strive to correct any anomaly that undermines progress in the party, including the grave mistakes that took the then ruling party to the opposition. He noted that the movement has great respect for the leadership of the party, but that they would not worship leaders, hence the push for constitutional amendment where everybody would be an important player. Kamara reflected on the process leading to the 2018 elections in which the party selected candidates, he averred, were not in the good books of electorates, stating that the selection clause of the party’s constitution should be repealed. “Selection is no longer applicable in modern day democracy, therefore the selection clause in the party’s constitution should be removed. The people’s voice should be supreme and not an individual,” he charged. He dilated on the term limit of certain executive positions, adding that the party’s constitution didn’t make provision for such, and further highlighted the need to separate the position of standard bearer and Chairman and Leader of the party. “The situation where we have the flag-bearer serving as Chairman and Leader of the party should be looked into. That is wrong and we should review it because we need a Chairman and Leader that would purely focus on the affairs of the party,” he said. He noted that the group further demands reform of the National Youth League, which according to him has over the years reduced its potency to bootlicking and praise singing of certain individuals within the party. Reading the findings of the report, Alfred Minkailu Koroma, aka Political Harash, stated among other things that, the sacking of Vice President Samuel Sam Sumana, the removal of Emmerson Sahr Lamina as Mayor of Koidu City, and mistreatment of many party stalwarts as some of the reasons the APC is now in opposition. “It is an open secret that the sacking of the former VP and the illegal removal of the former Mayor of Koidu City in Kono District gave birth to the Coalition of Change (C4C).The treatment received by Ibrahim Bundu of Port Loko, Peter Bayuku Conteh of Koinadugu, Alimamy Petito Koroma of Kambia, Dr. Richard Konteh of Gbendembu can all account for our defeat in the presidential race in the 2018 multitier election,” he noted. Koroma, a one-time students leader at Fourah Bay College, also maintained that poor campaign coordination at national, regional, constituency and zonal levels, improper campaign message, disrespect for the office of executive members at district level, arrogance, greed and selfishness, defunct Women’s Congress and Youth League, the selection clause, dual citizenship saga and mismanagement of campaign funds were the other reasons for the defeat of the APC in the 2018 election. 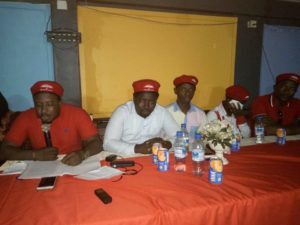 Paul Kamara, former Minister of Sports under President Koroma, called on the APC party hierarchy to listen to the demands of the radical youth group for the betterment of the party. 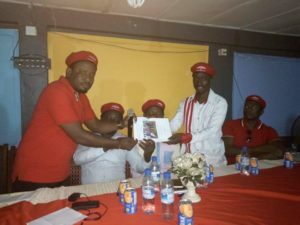 Also, editor of We Yone newspaper, the official mouthpiece of the APC, Winston Ojukutu-Macauley, was in attendance and declared support for the youth group, adding that they were on the right track of taking the party to its correct path.